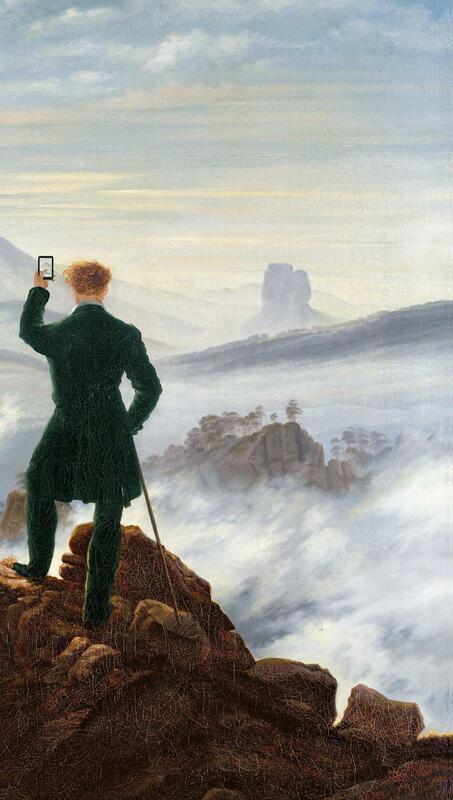 Based on Wanderer Above the Sea of Fog, by Caspar David Friedrich (1818). I was, in other words, a very early adopter of what we might now call living-in-the-web. And as the years went by, I realized I was no longer alone. Facebook soon gave everyone the equivalent of their own blog and their own audience. More and more people got a smartphone—connecting them instantly to a deluge of febrile content, forcing them to cull and absorb and assimilate the online torrent as relentlessly as I had once. Twitter emerged as a form of instant blogging of microthoughts. Users were as addicted to the feedback as I had long been—and even more prolific. Then the apps descended, like the rain, to inundate what was left of our free time. It was ubiquitous now, this virtual living, this never-stopping, this always-updating. I remember when I decided to raise the ante on my blog in 2007 and update every half-hour or so, and my editor looked at me as if I were insane. But the insanity was now banality; the once-unimaginable pace of the professional blogger was now the default for everyone. But the rewards were many: an audience of up to 100,000 people a day; a new-media business that was actually profitable; a constant stream of things to annoy, enlighten, or infuriate me; a niche in the nerve center of the exploding global conversation; and a way to measure success—in big and beautiful data—that was a constant dopamine bath for the writerly ego. If you had to reinvent yourself as a writer in the internet age, I reassured myself, then I was ahead of the curve. The problem was that I hadn’t been able to reinvent myself as a human being.